In this post I explain the supreme importance of understanding the true nature of money, which is, literally simply a record of half-completed transaction. A correct understanding of money enables us to avoid risk, helps us avoid enslavement and gives us an incredible freedom, literally opening the doors for us as others around us fall. I consider it the second most important aspect of life. The basic [double entry] accounting rule is that if you have an asset then there is always an equal and opposite liability. When I have money (a coin, a note, an IOU, stock or bond) there is ALWAYS a corresponding DEBT – the liability from the person or entity that issued that money – no exceptions are possible. Thus . . . money is only ever A RECORD OF A HALF COMPLETED TRANSACTION. When the money is eventually returned to the issuer, then the liability is discharged, the transaction is complete. This is a vitally important consideration – its significance is often overlooked. The best way to understand this concept is to ask why the Reserve Banks of the world can burn their old worn-out paper money. One day a $100.00 note is ‘worth’ a dozen McDonalds burgers, but the next day it is worthless and they burn it. What happened to change money into paper? They ‘issued’ it then ‘redeemed’ it. It = the liability, the debt associated with that note. The liability had been discharged thus the largely hidden and rarely considered aspect of money is revealed. Note though, that the one dollar note WITH a liability looks exactly like a dollar note WITHOUT liability. If you helped yourself to a whole bunch of genuine but old, worn-out dollar notes on your way out of visiting the Reserve Bank, you could easily fool others into accepting them because they LOOK the same. Ditto counterfeit money, it looks the same but when you come to cash it with the Reserve Bank (completing the transaction) they will quite rightly reject the redemption. DECEPTION occurs when we treat money as a COMMODITY (i.e. something that has a life and existence of its own, i.e. separated from that DEBT (liability). The natural way of the world is that traders determine (at the point of trade) what they will trust as the tool by which they will record their assets and liabilities. Bankers, with active cooperation from governments attempt to deceive us that a dollar, stock, bond, coin or other forms of money are REAL money however their trick is to confuse us with economics and economic theories that encourage us to view money as a commodity, something that we own which they then say should be monopolised, issued, controlled, charged for etc etc. Removing the liability from our thinking processes permits deception to occur for an asset is only as good as the capacity of the issuer to pay it back. Thus to measure our true risk when using their money we must know what that liability is and how ‘good for it’ the issuer truly is. Thinking of money in ANY other terms opens us to deception, manipulation, risk and eventually enslavement. The common phrase that we use to describe this phenomenon is that, “The love of money is the root of all evil!” but the METHOD that this comes to us is through the treating of money as a commodity, something tangible like a bicycle, pound of butter or a coconut which it never is. Imagine that I ‘sell’ 100 coconuts to my friends for an IOU from them all – paper IOUs. The subtle change comes when my IOUs are viewed as something of value in themselves, rather than what they represent (which is debt). This is a slippery slide and different people understand money to different degrees BUT imagine that I take my IOUs into town and convince others to exchange them for items from a shopkeeper who then uses them to buy from an importer from the island next to mine. We may call each IOU a DOLLAR and subtely we start to count our Dollars which in due course became well recognised as a currency. After a while nobody even bats an eyelid at accepting our DOLLARS even though the people who signed the IOUs might have died, left the island or forgotten about them. A manipulator or controller will never refer to the debt (the second part of the money) instead constantly talk about and around the commodity. Politicians do this all the time quickly referring to “our capacity to service the debt” without noting that debt is DEBT and that a sovereign nation (like in my case Samoa to the tune of a billion WST) has no need to be in debt to anyone! The morality of borrowing ignored for the moment. No matter how we treat those IOUs the nature of the money however has not changed – it is still a piece of paper that represents the original debt, yes passed on through others possibly many times but it is still nothing more than a record of a half completed transaction at heart. The further that the IOUs are extended, into derivatives, loaned out used as equity for more borrowing, leveraged through all manner of digital trading and banking tricks the less obvious that we’re simply dealing with an IOU, a DEBT. I’ve been analysing the Bartercard Trade Dollar for a while now and it is losing trust within the Bartercard economy – that’s called inflation – as the members are losing confidence that they will be able to spend it as easily as before, and therefore they hike the price of their goods when they sell and they want cash in part trade as often as possible. The reason is that Bartercard principals have been stripping the currency (debasing it) and concealing their debt. They’ve done it very well for decades but the point is that every Bartercard Trade Dollar has an equivalent DEBT behind it which balances the asset. Too many Trade Dollars in members hands and that means HUGE debt! One day it will all go pear-shaped for them – promise! People using Bartercard Trade Dollars need to know and understand this well – a Credit Balance is not an asset, it is a RISK and the risk is that they, Bartercard, the issuers of that currency will not be ‘good for it’ when push comes to shove. Ditto with currencies from the nations of the world! It gets more complicated when the government and Central Banks get involved because again like Bartercard the true debt is deliberately disguised and concealed. Yes I DO mean that! Do you really think that a politician would tell you ALL the debt he’s racked up while in power? Off Balance Sheet liabilities not only exist but are likely huge, and that’s on top of government bankruptcies – which most of them are. When I exchange my labour for wages and I receive a piece of paper (hopefully lots of them) that gives me an asset in my mind, BUT this only represents what who ever issued that piece of paper OWES ME! Great if they are good for it but I can assure you that for yonks there are serious questions over the systemic and deliberate hiding of debt by swathes of the leaders in the banking/political space. Give a man a pile of USD notes today and his face will usually smile because he thinks he has money. He actually only has pieces of paper that represent debt from the US government. Stocks, bonds, investments and all financial and economic theories and assumptions are based upon the one-sided view that we have an asset, a commodity and that we can therefore control it and issue it. This is the deception that has enabled the elite to profit by consolidating power and wealth for eons. A coin or a dollar is widely recognised as money and asset, a commodity like a pineapple or a pound of butter but it’s not. This has huge ramifications for the discerning – currency designers, traders, investors and all who touch money. My advice is to get rid of the ones based on hidden debt and convert it into something of real value – and fast! I’ve read much of your work and I can’t see what is necessary to your overall thesis that a transaction is something “half completed”. I think you could usefully drop that baggage. No way! This is THE definition of money and so important to understand! The commonly used definition of money is that it is simultaneously a unit of measure, a means of trading and a measurement of value. Logically it cannot be all three the same as a litre is not a jug, nor is it water. Money cannot be all three at the same time. In fact money is only ever a UNIT OF MEASURE – a dollar note can be used to measure credit/debt but the dollar notes are just the equivalent of a measuring jugs. The WATER is the tangible debt and the LITRE is the unit of measure. Not even gold changes this factor – it is trust in gold or the dollar that gives it its value. Trust that someone somewhere will return value equal to what we invested to get it in the first place – and THAT is the second part of the transaction, the part that is missing from most discussions about economics and economies – the debt. 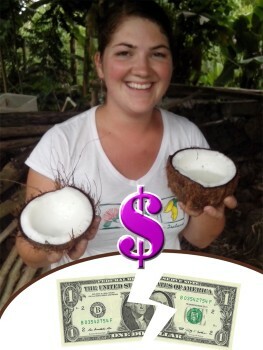 A simple example of natural money is if I trade my coconuts for IOUs to help my friends and neighbours. When I give them my excess coconuts I receive a credit with my friends. They have a debt to me, so that when I’m short sometime in the future they will (hopefully) pay me back. They then have a liability and I have an asset – a pile of 100x IOUs – my “money”. Those IOUs are the equivalent of cash issued by the government. The difference between the dollars issued by the Central Banks and monopolised by the governments of the world is that my IOUs will still be the same value in 10 years – theirs won’t because of inflation – caused by the charging of interest. I can easily exchange one of my IOUs with a neighbour and take one of his pineapples on the basis that he can get a coconut back in due course from the person who issued the IOU. This is basic Mutual Credit – perfectly natural trading and natural money. In my IOU system (all things being equal) a coconut will still be worth a coconut in a year, or two or ten because it is a Mutual Credit system that is perfectly balanced – each party agrees to extend credit and we carry the risk of default among ourselves. The important thing to note before we move on is that for one IOU there is an equal and opposite DEBT. This IOU, my money is literally THE RECORD OF A HALF COMPLETED TRANSACTION because when the coconut is repaid to the holder of the IOU (probably me but it could have been transferred) the IOU is ripped up. When the second half of the transaction is completed the IOU (i.e. my money) disappears. The English phrase commonly used in this situation is, “We’re all square!” That’s basic accounting. People are VERY cautious about accepting new money (for example like my IOUs) checking the likelihood of redemption before accepting them but they very rarely consider the second aspect of measuring money when it comes to legal tender currencies. This is foolishness and simply conditioning from decades of slick marketing and political compliance with T [real] PTB. The backing of a currency, the aspect that ensures that the money is respected, accepted and widely used is only ever trust. Some people consider the good name of the US Government to be sufficient backing. Others think that gold or land are good reference points, however while there are merits to these, they all, at the end of the day come down to TRUST – trust that the issuer of the money will be ‘good for it’. I know this sounds weird in a world of greed, liars, cheats and thieves but the only really sound reliable backing is human relationships. Think about this – by their own figures the US Government is insolvent and debt is in the stratosphere and getting worse. Virtually every government on the planet is in varying degrees of debt [to the Central Bankers of course]. Gold value is grossly manipulated – just ask who owns the world’s goldmines and you can easily work out the real situation – it’s the same people who own [in a few cases control, not own] the Central Banks – duh! In peacetime land can be a better backing of a currency but a gun devalues land in a jiffy! Ask any indigenous person what happened to their economy when war occurred. And remember that lawyers and guns fit together like a hand and glove. Most of the 20th Century land confiscation has been done legally behind the scenes with sovereignty wrested from people-groups by willing compliance with United Nations treaties and agreements. All this reliance on commodities erodes the true backing of a currency which is only ever at the end of the day two people trusting each other to make-good on their transaction. Contiguous lines of trust in a physical (or digital) community are the safest, most natural form of backing that can exist. Not even World War 3 and confiscation of my land and even all land around me can change the fact that I have 100 people who each owe me a coconut from my helping them one, two or ten years ago. That trust in humans is the ONLY true form of backing that a currency can ever have. Monetary Reformers and currency designers should be looking at ways to build systems around the real building blocks of money, rather than basing their designs on theories that start half-way up the chain of monetary study. The ONLY people who can ever truly value money [a currency] are the traders and this is only ever done at the point of a trade/transaction. I’ve explained this more in my book Mistakes of the Monetary Reformers when I discuss the folly of attempting to force a centrally managed economy down the line of command to users. Bartercard, for example, is desperate that their members continue to value their currency 1:1 but are fighting a losing battle. Likewise with the USD. Uncle Sam is desperate to keep people believing that they are ‘good for it’ with the USD but no centralised system can ever fool a trader who truly understands money. So let’s wrap-up then . . . The Deception is that money is a commodity, when it’s NOT – it’s simply . . and yes you’ve surely got it by now . . . a record of a half completed transaction! The Dangers from this incorrectly viewed situation are that we succumb to control systems, pay interest unnecessarily and lose the natural relationships and creativity that enable us to prosper. We take risk chasing the rainbow only to find that the gold was an empty promise of the Wizard’s making! The Solutions require us to take personal responsibility for our financial affairs, removing debt, especially that to the elite that enslave us, then to build our own personal trading capacity, credibility and to build real assets with and from those around us. We need to develop our own currencies and credit lines independent of the centralised systems of control and to base them on Mutual Credit. All of us from the leaders of a nation to the lowliest worker will need to do this in our own centres of influence as the squeeze comes on. Oh and my teaching here also aligns with that of the Master – in principle and in practice. I like it when God agrees with me [This is humour humor, for the Americans who don’t ‘get’ British jest]. BTW Jesus wasn’t interested in gold, because He understood the true nature of money, that basing ones trust in THINGS is simply putting ones trust in what other [fickle] people consider valuable which can then be manipulated and is therefore ultimately an exercise in futility. His advice was to trust Him (as a true representative of His Father of course). People who seek pain will always find a way to get it.